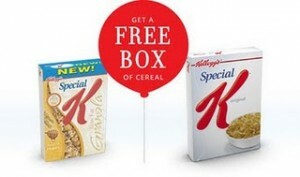 The Special K cereal coupon is available again and has reset! Just go here and either login or register to access a new buy any Kellogg’s Special K Cereal, get one 12oz Special K Original or 19.5oz Special K Low Fat Granola Cereal FREE coupon! Print this while you have the chance! The print limit will most likely be reached quickly! You’ll need to login or register first. Click on the Savings Center link on the lower right hand side. You’ll need to login or register to access the coupons. In the bottom middle, there is a coupon link for $2 off one 24 pack of white cloud bathroom or any (2) white cloud or white cloud ultra 12 roll pack combo. You should be able to print 3 of these coupons. You should also be able to print a coupon for a FREE 4-pack of GreenEarth bathroom tissue with the purchase of a 12 pack or 24 pack of reg. white cloud bathroom tissue. Click on the banner advertising this coupon.